This time of year, I always check the weather out at Smith. Finally, a nice weekend! Amy and I headed over to Smith w/ the Callahans;-) OK Dan Sewell and Susie Callahan. Susie decided to go skiing w/ the kids while Dan abandoned his fatherly duties and went climbing. (just kidding, he hit the slopes on Sunday) We decided on the Super Slab since Dan hadn't done a multi-pitch. 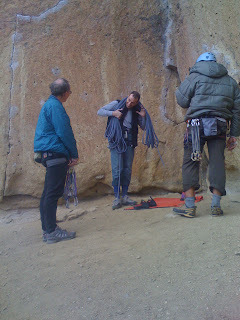 I lead the pitches and rigged up the belay to belay both climbers as they climbed at the same time. Dan tops out on the 1st pitch. Our route was in the shade most of the way. Here comes Amy, bundled up, packing her and Dan's Puffy coats for the Belays. Sometimes, you wonder if climbing in the cold is worth it when you could be at home cleaning the garage. As you can see from Dans grin, he wasn't into cleaning the garage. I lead up to the top of the 3rd pitch where I was greeted by the sun. When I belayed Dan and Amy up, we relaxed up top like lizards on a warm rock; and life was good. We finished off the day on Caffeine Free. The addendum has it at 10c but there no way. Easy 5.10 at the most. I'm guessing somebody got overzealous cleaning the holds and made the lower crux a bit easier. If I were to label myself as a climber, I'd be a monkey. Long arms and almost as smart as a human. If I were to label Amy as a climber, she's a gecko skilled in ballet. Very graceful. Dan is a badger. He battled his way to the top of Caffeine Free. He jumped, clawed and scratched. At one point, he was doing the iron cross. 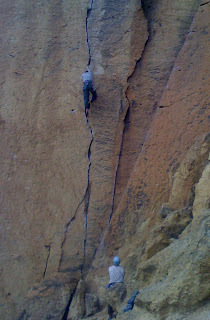 On the 2nd crux he pulled his hamstring! It didn't stop him. Not too bad for someone who has only climbed on rock 5 times. A couple months ago I gave the Karate crack a shot. I took a ton of gear and started up. I quickly found out that the route likes 1 and 2 inch cams and not much else. I only had 4 of these. Thus, I ended up w/ these monster runouts that were so mentally taxing, I ended up hanging a couple times. I finished the route but went home w/ my tail between my legs. If you could zoom in, you'd see a me in the shaded pod. Grinning like a fool. With a few more pull-ups under my belt and a few barrowed cams, (Thanks Vincent) I started up again. This time I had enough gear to place a peice every 10 feet instead of every 20 feet. The route was still very hard for me but w/ out the added stress of a groundfall, I made it to the top clean. 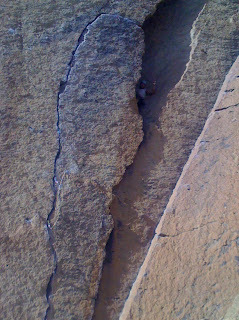 People say the traverse is the hardest part but I think the crux is 2/3rds of the way up the vertical section of crack. Normally, after I lead a route thats real hard for me, Amy walks right up it. It makes me want to break her fingers. On this day, she actually had to work to get to the top and I was very pleased. Amy trailed the other end of the rope so we could keep the top rope up. 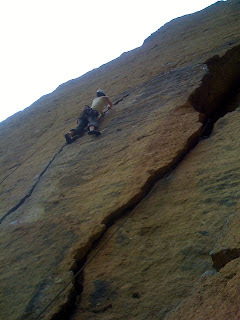 We could then leave the traverse protected and keep on climbing it w/out having to re-lead it. I learned this from Haydar's friend Andrew. I was feeling pretty good about my accomplishment when Haydar and his friend Andrew waltzed up. Now in the presence of the Chemeketan Crack Master, I was back to reality, I'm just a Crack Baby. Haydar showed us how it's done. (I'm still psyched about my lead, just a bit humbled) The four of us went and fooled around. We went to Moonshine where I followed Andrew up the route. He placed 5 peices for the whole route. When I lead it, I think I use 10 or more. Its always nice to climb w/ folks who are alot better than you. This way, you'll always remember that you're really just a pathetic loser. 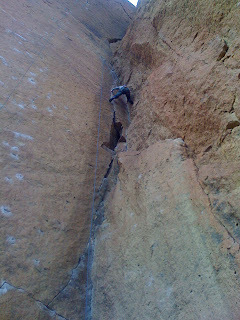 Haydar stemming through the top of Moonshine Dihedral, I think this is the best trad 5.9 in the park. Amy and I headed down the wall headed back towards the car but we weren't done yet. We saw that the Outsiders wasn't being climbed. Amy has lead the top 3rd of this route on accident once before. (Sorry Bryon but I've got to do it) Last Winter, Bryon started up this route when he got stuck a couple bolts from the finish. (It was the end of the day and it was his 1st day climbing in a long time) Being the shovinistic pig that he is, he assumed that I would have to finish the route for him;-) It never occured to him that Amy might do it. Amy, thinking that the route was 5 gallon buckets offered to clean up after Bryon. She made it to the top before I came around the corner to see her finishing up her 1st 5.9 outdoor lead. Amy has always been a better climber than I am but she holds back when she's on lead. (I think she's smarter than me also) Feeling confident from climbing the Karate Crack, she offered to lead the Outsiders before we went home. 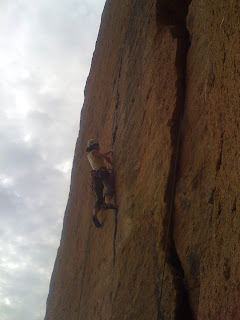 At the top, where it thins out, she balanced her way through the crux and got to the anchors. (Sorry no pictures, that whole "one hand on the break" thing was cramping my style) It was the first outdoor 5.9 she lead on purpose! We had such a nice weekend visiting w/ the Sewell/Callahan posse, Haydar and climbing some fun routes, we were so pumped, we almost ran home. Where are all the pictures of you pumped, gripped, and run-out on the karate?!? !